Huge burritos that could feed at least 2 !! Steak and cheese burrito was amazing. We also tried the homemade fries that came with a white ranch dressing sauce that was amazing!! 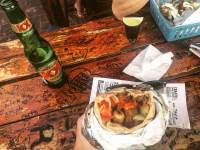 Get the build your own burito and bucket of beers! Friendly staff it's really tiny don't miss it! 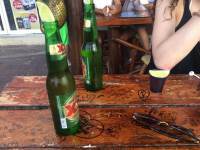 You sit on stools outside one the sidewalk- the music is a mix of Mexican and Rasta. 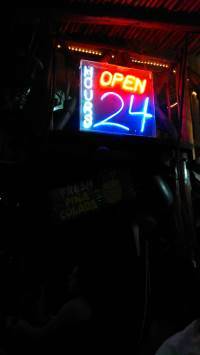 And they're open 24-7! 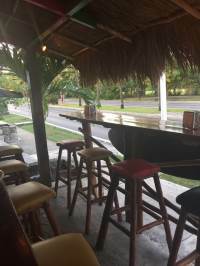 Original place with great atmosphere. 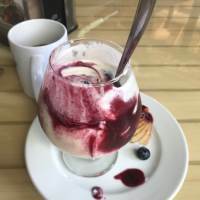 They have delicious food and coctails! 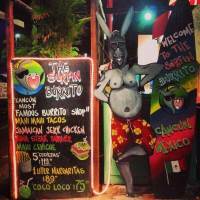 It's a must to vist in Cancun! I have read reviews of this restaurant over the years, but we went here for the first time during this September vacation. 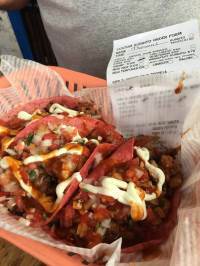 Taking the bus, it is an easy trip to an inexpensive and delicious meal! I wanted to get back for breakfast, but did not make it. Next time, perhaps! 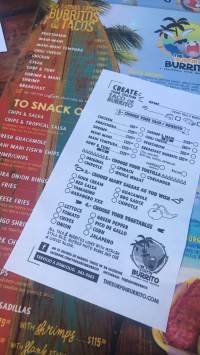 My husband and I enjoyed made-to-order burritos, but we overheard a group ordering coconut shrimp (four orders!) and think this must be a great dish too! This is a bargain, and you get a huge burrito. 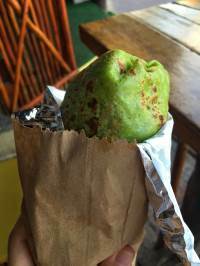 Burritos are not available at other restaurants since they are Tex-Mex, so when you are in the mood, make your way to this little treasure! highlight of my trip ... place was awesome!!! Burrito was very good. 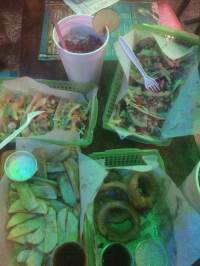 A lot of meat and veggie options - and they're huge so you get your money's worth! 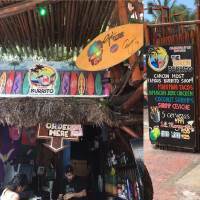 We discovered The Surfin' Burrito, along the main strip in Cancun, as it played loud music and bar stools were full- We figured a must try! We opted for Grilled Mahi Mahi Tacos, with literally EVERYTHING on it- and also a Steak Burrito in a chipolte tortilla. Both amazing. Highlight was the "elote" topping which is grilled corn off the cob in mayonaise and seasonings- super tasty! Not your typical local shop, rather a North American comfort, as they boast "California Style"- Next time we must try the Coconut Shrimp, as the people sitting beside us had them & they looked delicious! The custom burritos are so tasty. 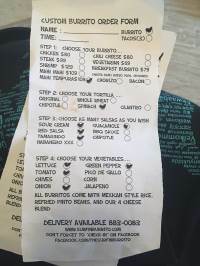 You get an order sheet with a bunch of tick boxes, and a Sharpie. 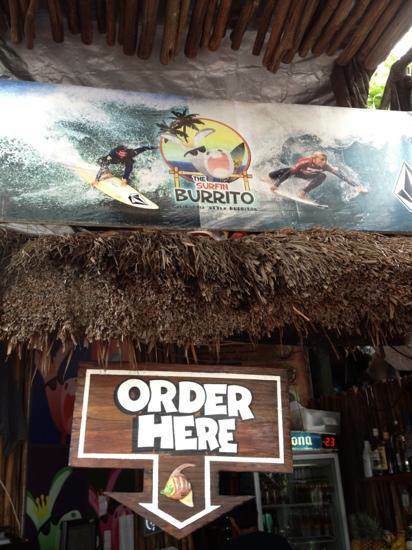 Order your burrito just the way you like it. You won't be disappointed. If you pass up this gem, expect regrets! Dinner for our family - four adults - was memorable because of the superb food. 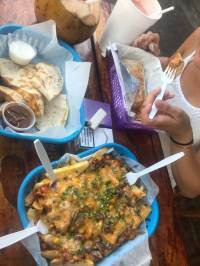 Yes, it is small and close to a busy roadway, but everything we ordered was outstanding - fresh, tasty, and carefully prepared. 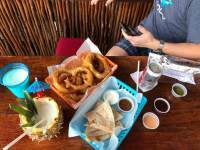 We had guacamole and coconut shrimp for our appetizers, which were top quality. 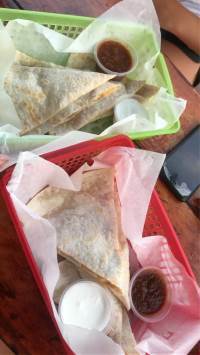 Main dishes included burritos and cheese quesadilla. 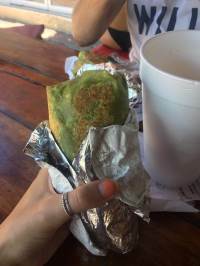 Seriously, I cannot recall ever having a better burrito anywhere. Service was timely, friendly, and laid back. If you are staying at the Hotel InterContinental Presidente, the restaurant is only a two minute walk. Prices were so reasonable, which just convinced to go there again and again! The food is brilliant and well-prepared. I've had just about everything and it's all great. Don't forget to say hi to Shantel. She´s another good reason to go there! Great food, had burritos from there at least three times during out visit! Great customer service and environment. I'm not a fan of Chipotle but I definitely recommend this similar style of burritos. 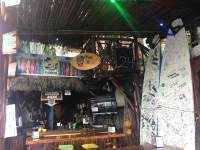 This is a California style restaurant. Also, if you want to get to know people this is community seating. (not everyone likes sharing your table, we love it.) we ordered the mango ceviche..I loved it...not your traditional ceviche...no strong lime taste...mangos, cucumbers, onion and tomatoes....fresh and delicious..(my husband prefers traditional lime...this is NOT it). 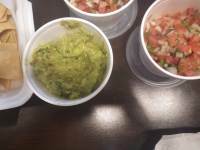 The salsa and chips are fresh tomatoes, onions, etc. no spice so all can enjoy. 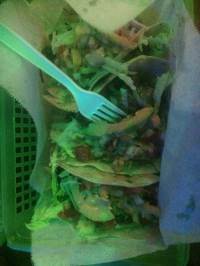 I ordered Mahi and shrimp tacos...delicious. My adult son ordered a burrito..huge...he said t was good. My daughter, 10, ordered quesadilla w/ chicken....she LOVED it. Service was very friendly. The only thing I would change is more places to sit and eat! I wish I would’ve taken a picture beforehand but I was so hungry that I didn’t get to do so. My boyfriend found this place on google so we decided to try it. It was DELICIOUS. My boyfriend got a chicken burrito & the jerk chicken wings with fries. I got the steak quesadilla & steak nachos. It was so good that it put me in a food coma. We got the food delivered to our hotel with no problem. The gentleman couldn’t understand what I was saying over the phone so we had the front desk tell him where the hotel was located. I wish I would’ve tried one of their drinks on their menu. Sounded so delicious. The food was also inexpensive. 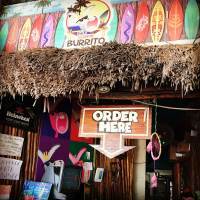 We stopped here for breakfast burritos while in Cancun. Absolutely the best food we had while we were there. Great prices and also great service. This is a great find in the hotel zone! 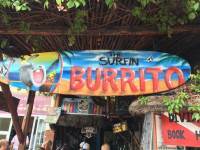 We have been going to Surfin Burrito for many years. This is one of my kids favorite spots. We always eat there at least twice during our vacation. The burritos are wonderful and very fresh. Thank you Anna for always remembering us. Can't wait to return next year. 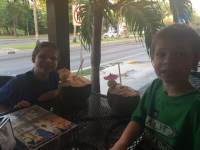 Ate here with my family... 2 younger (very picky) kids and they loved it! 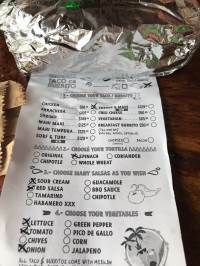 There are many options and you can build your own burrito. 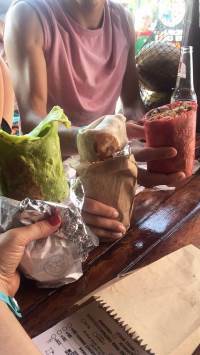 The burritos and drinks are large in size and are very affordable. I would recommend this place in a heartbeat! Awesome job! 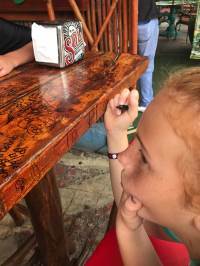 Oh and the kids loves to draw on the tables while they waited. 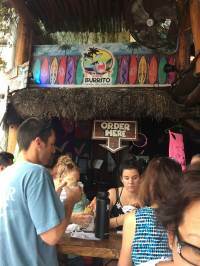 A fun place to grab a Burrito and eat at picnic tables or bring back to your hotel. Located in the hotel zone. 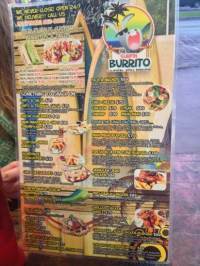 You can order a beer or frozen drink while you wait for your burritos. The guacamole is good and the chips are tasty. 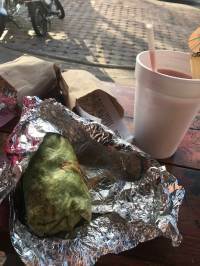 I got the chi-pole tortilla for my burrito and enjoyed it thoroughly. I had enough leftover for breakfast the next morning! 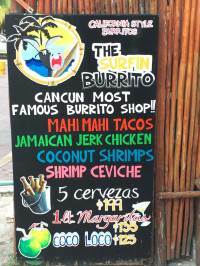 At least plan on eating here once during your stay in Cancun! 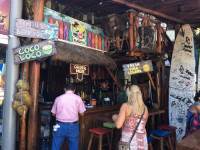 Our go-to in Cancun! Cute little spot with excellent food! Everything is fresh. 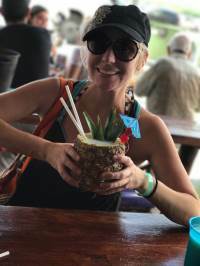 The drinks are the size of your head. And the prices are fair! Can't recommend this place enough! 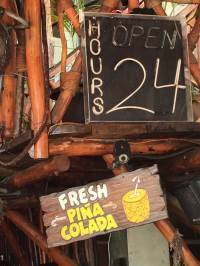 Excellent food, cold drinks, reasonable price -- YES PLEASE!! 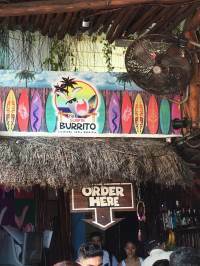 We wound up here twice while we were in Cancun and i still dream about those burritos - lol. Best burritos I have ever had. I had the shrimp and could not help but go back for more. 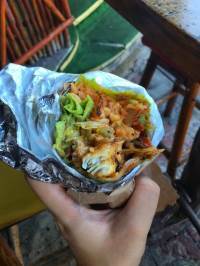 So full of delicious flavour from the soft tortilla shell to the amazing assortment of fillings available. Also recommended is the Sangira! 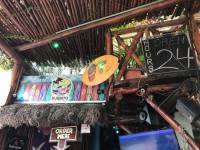 Went here on our first night n Cancun and has the best Quesadillas ever! Would definitely return here! 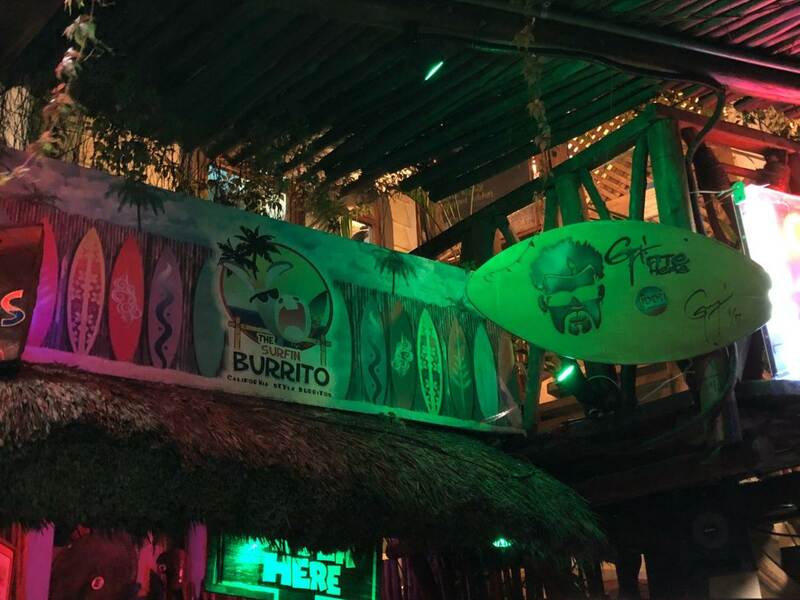 Visited the Surfing Burrito after party at Coco Bongo. Best value-quality food and definitely a must eat. Menu have good snacks and beverages. Service is good and they offer good cocktails. 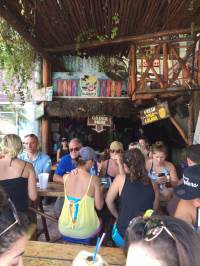 Try the margarita! Great food, great service....awesome Margaritas!!! We went here almost every day of our vacation! 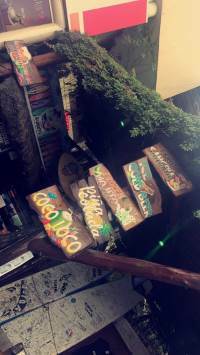 Great food, great drinks and very nice service. Highly recommend! I have eaten Coconut Shrimp before but this Coconut Shrimp is the best I have ever! 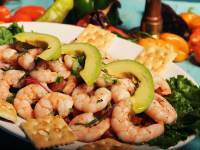 It was just the 'meaty part' of the shrimp, no tail. 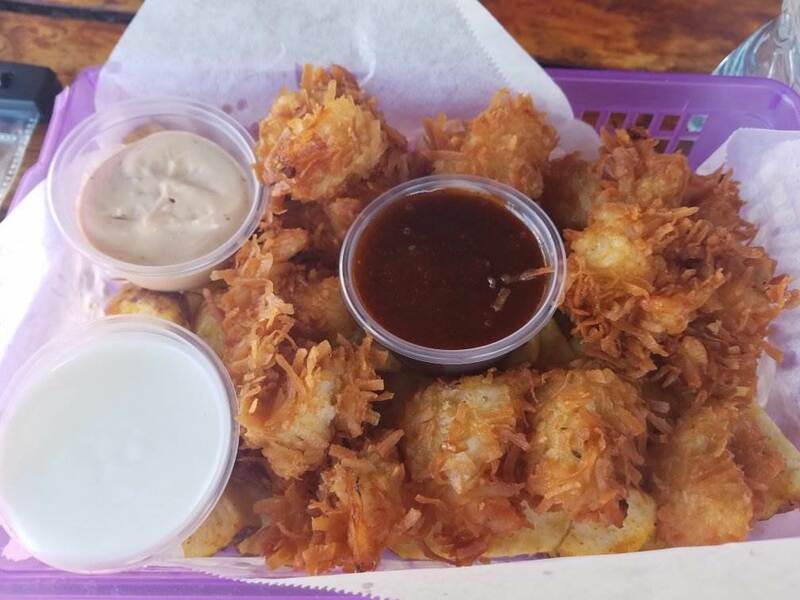 They are bite sized with a delicate coating of batter with a good portion of coconut. Fried perfectly golden brown! The portion size was large and filling. It comes with steak fries too! 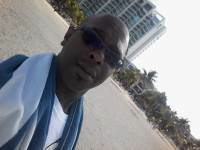 I will definitely be back!!! Easy to Miss but WELL worth the search!! 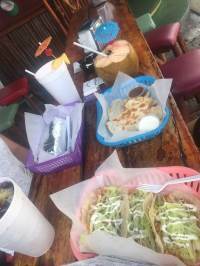 This tiny restaurant is tucked away on Kukulcan Blvd just across from the Flea Market and next door to the XOXO! 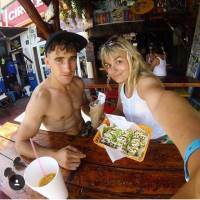 Great Burritos and friendly staff! Yuuuummmmmyyyy! 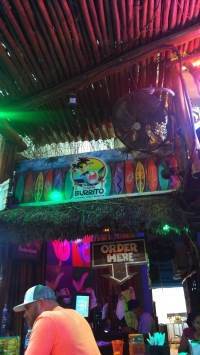 Everything from the food to the cocktails!It’s for sure a must do while in Cancun. The vibe of the place is super super chill. 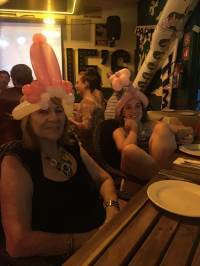 It’s a place for any age too! 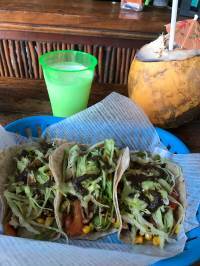 We had the Jamaican Jerk Chicken taco and what an amazing option that was. 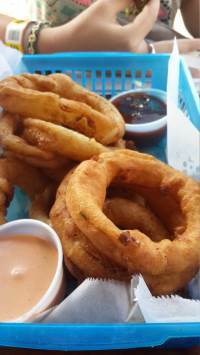 We also had the fresh onion rings and home made chips/wedges. But the food wasn’t all that was great. The HUGE cocktails were delicious, cold and refreshing. And did I mention HUGE? Open 24 hours it’s a breakfast, lunch, dinner, hangover cure, drunk munchies. What more could you want?! Ps. The reggae versions of classic songs were epic!! 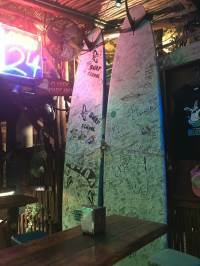 We visited here after seeing the place on the food network show 'Diners, drive-ins and dives' . 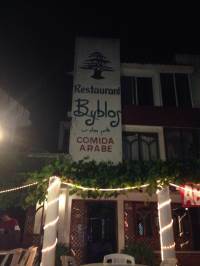 The husband recommend we visited i was unsure as it wasnt a restaurant per say and it is in all effect a small street food bar on the road. 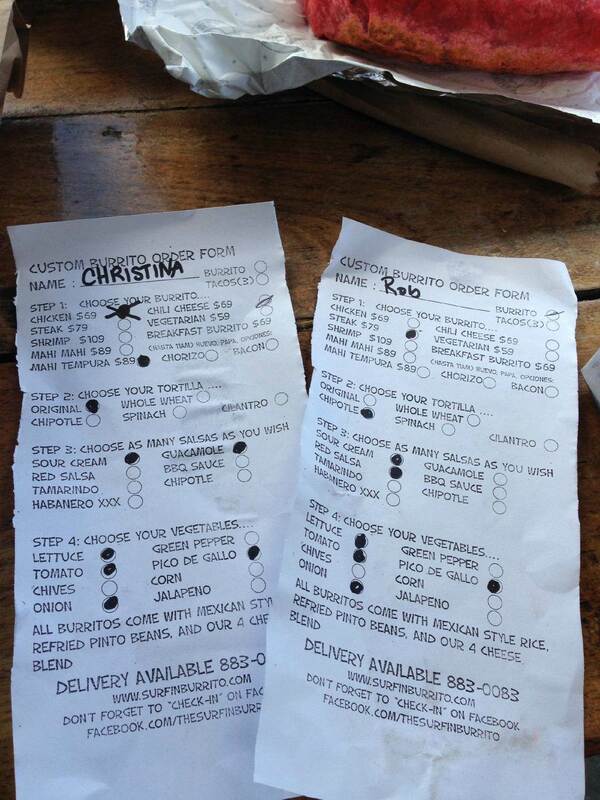 How WRONG i was the food is amazing we both ordered the build your own burrito and they were amazing. 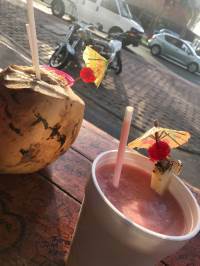 Made to order using the freshest ingredients, added to this is a strawberry frozen margarita which is served as a 1 litre drink with flavour in every sip. We enjoyed it so much we visited twice during our 2 week stay. The food choices they offer easily cover everyones tastes and the price for the amount and quality of food you get is great. I cannot rate this place high enough if you are in the area you need to go. Maybe not typical Mexican food but good to try as you can pick what kind of tortilla you want, meat and extras. Get one of the Mojitos! Huge and super goood! 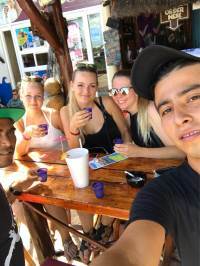 Made friends during our recent visit with a local that lives in Cancun. 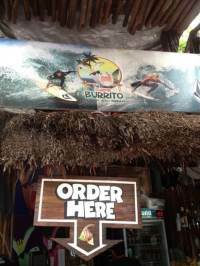 We asked for a recommendation of a place that we should try and he recommended Surfin Burrito. 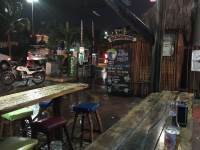 He said he and his girlfriend (who works at one of the hotels in the Hotel Zone) love to frequent this spot as the food is always good and the prices are reasonable. Had to agree after we tried it. Portion sizes are huge! You won't leave hungry. 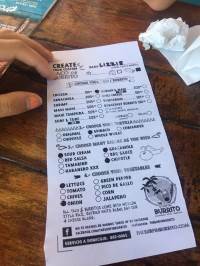 We over-ordered as we wanted to try a few things (build-your-own burrito & the coconut shrimp). Both were excellent. Pina Colada was good and large enough to share. Will surely go back on our next trip. Took off one star due to limited seating and "ambiance" lacks as it's right on the street next to an over-flowing dumpster (maybe to some, that's part of the charm). 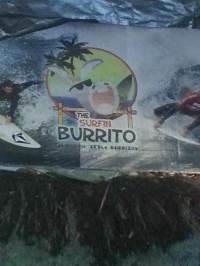 Surfin Burrito was very tasty! Saw this on Food Network. Had to totally try it. 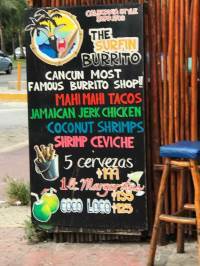 tried the shrimp ceviche, surf and turf burrito, coconut shrimp and a Miami Vice drink... very reasonable prices.... The drink was huge! had to share of course! This is a very small street shop. The line for food moves quickly and the Watermelon Ice Drink is a must try. 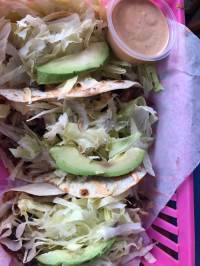 I had the tacos, they were very good. Prepare yourself for a line as it was very popular when we had lunch but it was worth the wait. 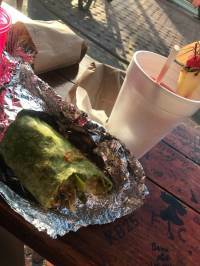 Great little spot that serves big burritos & large drinks. 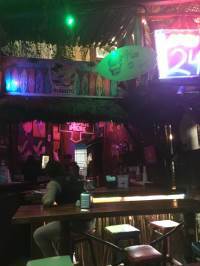 Been here a few times; wish I had time to try more drinks. Don't walk past it, make sure you stop! 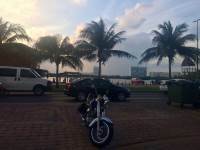 Walked 10-15 minutes from RIU Palace. I ordered a normal burrito with chicken and it was good. The strawberry banana smoothie was also good. 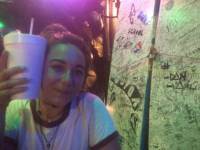 My sister loved her tacos and drink. We went around 2 and it wasn't busy at all. There are only a few tables and it's outside dining. 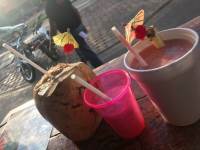 Still upset that I didn't get a coco loco. We were doing a little shopping to waste some time until out hotel was ready and came across this little gem. 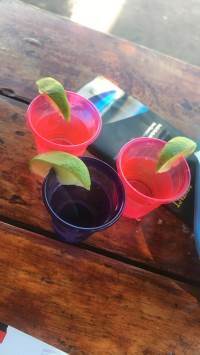 The drinks were huge and made with fresh fruit and an abundance of alcohol. 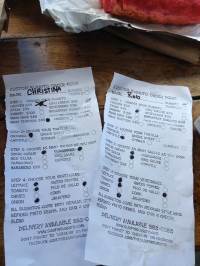 It was pretty busy but the the service was fast and the guys working the place were really great. The food looked delicious but unfortunately we didn't have time to eat but for sure on our next trip. Walking down the street and happened to stop because of the reggaeton music playing! 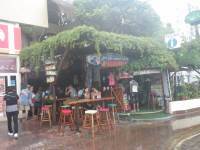 Great atmosphere, a good place to meet other tourists. 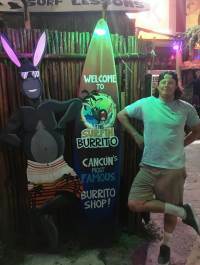 The burrito was delicious, even went back the second night! My drink of choice is the Surf´s Up Lemonade, so good!!! 1 drink is enough to get tipsy because it is a liter cup. Anna was an amazing waitress/bartender...she´s the sweetest! Definitely recommend to anyone visiting! 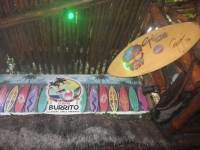 Well we hasn't been drop on our knees after our visit in Surfin Burito. The food is average at best. 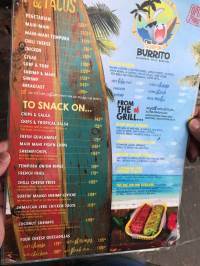 Burito was a little tasteless with burned flavor. The Coconut Shrimps were better but also dripping with fat. Overall nothing special and honestly not recommended. We visited on a Monday afternoon in July. Parking is terrible in this area, and pretty much non-existent. You can park across the street (lagoon side) and pay the attendant a minimal amount to park...if there are any spaces available. There is very little seating and you have to get cozy if it's busy. 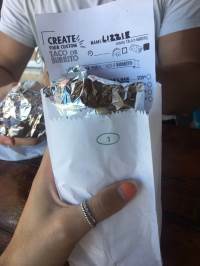 You have the choice of choosing an already created menu item or creating your own taco/burrito by filling out the order sheet. I made the mistake of adding tomatoes and onions to my burrito, not knowing they were using stewed tomatoes and sautéed onions instead of fresh ingredients. The chicken is chopped (not very small pieces) and possibly a mixture between white and dark meat. The jerk chicken tacos were definitely dark/white chicken mixture and a bigger hit with my bf than my chicken burrito creation (chicken, tomatoes, sour cream, onions, lettuce, salsa) was with me. But that was on the second try, since they came out wrong on the first go 'round. My suggestion would be to go with what is already created, unless you're going to have an opportunity to go more than once. The server was pleasant, but busy. The prices were reasonable. 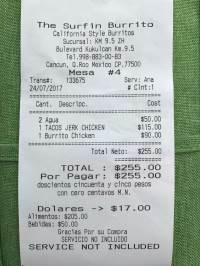 Two meals and 2 waters were $17 US dollars. You pay for your meal when you're done, at the counter. 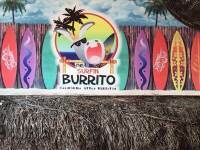 Not sure if I will return to Surfin Burrito, unless it's the only place open. Maybe it was the Diners, Drive Ins and Dives effect, but we were unimpressed by this place. 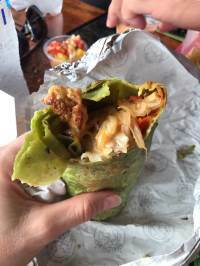 I think we expected to be blown away by the burritos here because of the reviews but honestly they were run of the mill and mostly just mushy rice and sauce that got soggy at the end. Our bartender and server were nice though our server didn't write anything down and kind of forgot everything but I'll give him the benefit of the doubt because he was the only server and it was crowded. Location is not ideal either, but they can't change that. 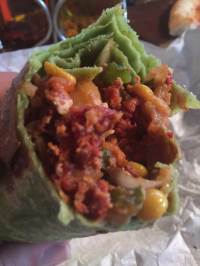 I do think if you are known for burritos though they should step up their game on that item. 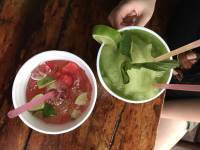 The tropical salsa was very good however and the drinks were really good because they used fresh ingredients. 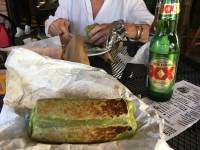 So maybe a drink and the salsa but as far as burritos, they were disappointing. Definitely did not bring us to Flavortown. Went to this place based on the great reviews. Its hard to find parking around here if you're not staying at a hotel that's walking distance. We found parking across the street in an abandoned parking lot that is run by a guy charging 30 pesos. Its a very small shack/food stand kind of spot. 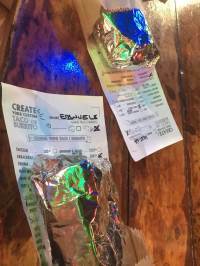 You customize your burrito and order at the bar. I liked that the burrito came out hot. The downside was that like half the burrito was filled with rice and beans so I couldn't really taste the other ingredients I chose. I didn't finish the last third of the burrito because there was too much soggy rice left. The other downside is that this place is nestled between a convenience store and a activity booking place so there's people walking by constantly. There's also a bus stop right in front so we saw many buses making their stops. Convenient if taking the bus here but not so much when you're trying to eat. Good vibes at this place and the food is alright too, however there is not enough space for everybody to sit down and eat which is a bit annoying. 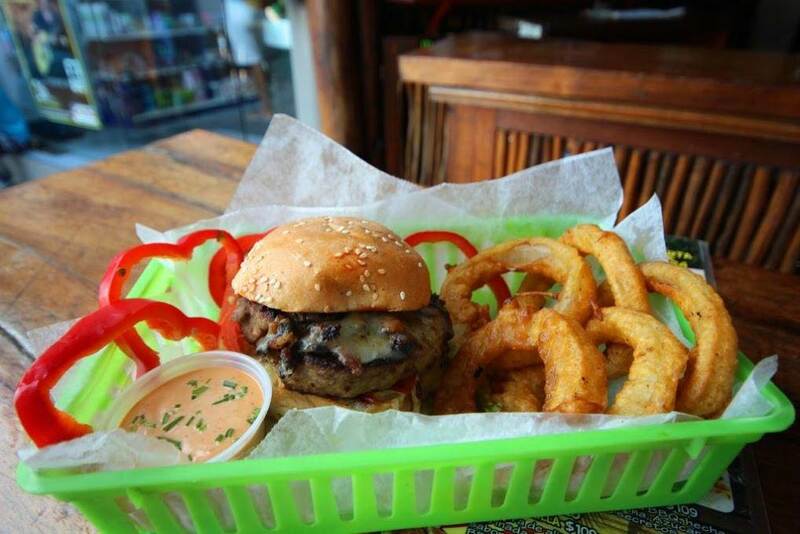 It’s a cool little place though which offers some nice dishes. It’s in a cool location too. I’d probably revisit. 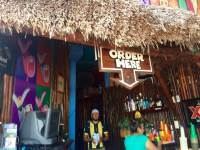 We have eaten here every time we go to Cancun. 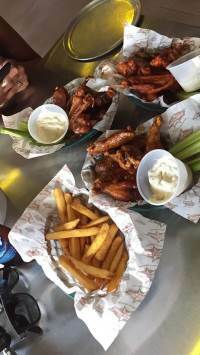 In the past we have been very happy with the quality of the food. 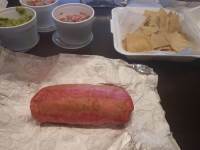 This time, the food was OK for my husband ( steak burrito) and mine terrible. 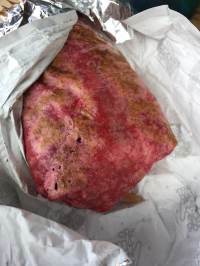 The fish burrito had a very old fishy taste, in fact, I threw it away. The waiter actually threw it away for me, yet did not care it was not eaten. Only good if you're happy to wait 3 hours plus.. I can't believe that this is run by an American after the horrendous service we received. Waiting over an hour and a half for food that never showed. The delivery driver had run out of gas and forgotten his cell phone (yes its true). We were then told we could have it free of charge.. But they wouldn't know when it would be delivered.. As they couldn't get hold of the driver.. So would have to made fresh and re sent. So a delivery time of an hour later was the most optimistic. On top of the 90 mins already.. Told them not to bother. Asked if we could have it the following day. They agreed. When we went to order the manager said it was only valid that evening and they would give us a discount of 25%. .. No thanks. I'll be telling the hundreds of people I send out to Mexico each week to avoid this place like the plague. Good luck. You're going to need it.